Maps: Sheet OL7 The English Lakes - South Eastern area. Start: SD476751. Silverdale Station (we parked at Arnside - SD458790 - and walked the short distance to Arnside Station and then caught the train to Silverdale). 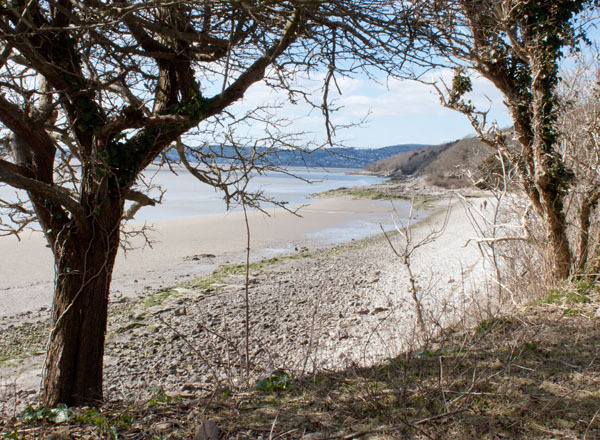 The walk crosses fields before following the coast for most of its length, partly along beaches and partly along the top of low cliffs. 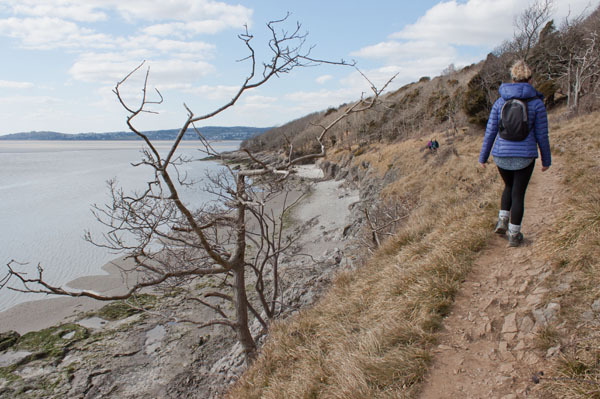 The coastal section may not be passable at extreme high tides (although there are alternative paths). 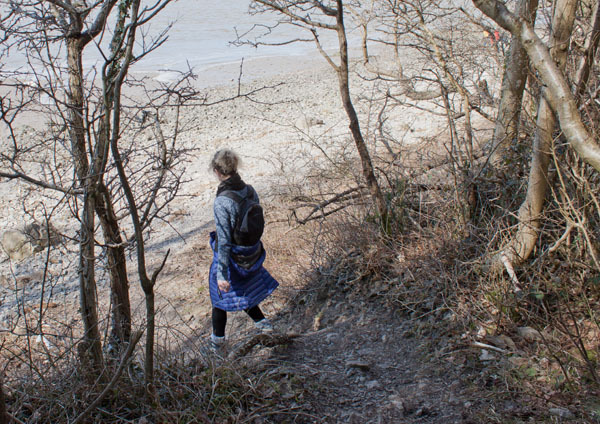 There are potentially dangerous drops from the cliff top path and care must be taken on the beach sections at high tide. 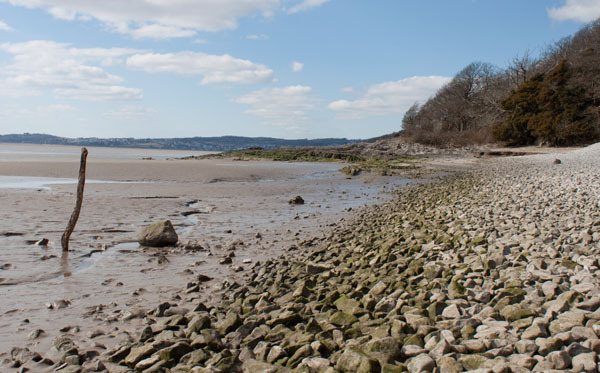 Wikipedia entries for Arnside and Silverdale. 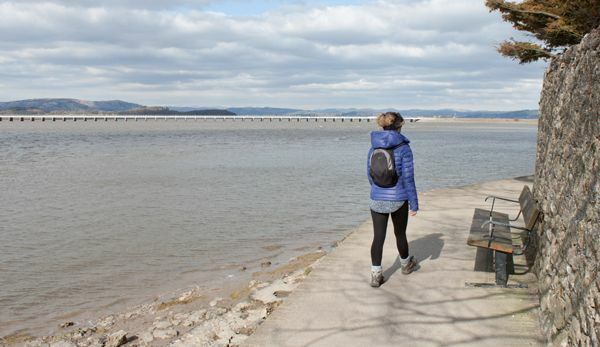 there are also coffee shops/cafes and a pub on the Promenade at Arnside and a pub at Silverdale - we enjoyed delicious homemade scones with jam & cream at Ramblers Café, Arnside. 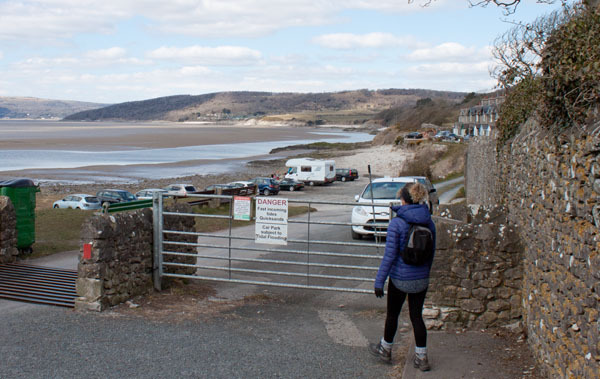 If you park at Arnside (as we did) walk to the north of the Promenade and follow the road round into Station Road. The station is on the left hand side. 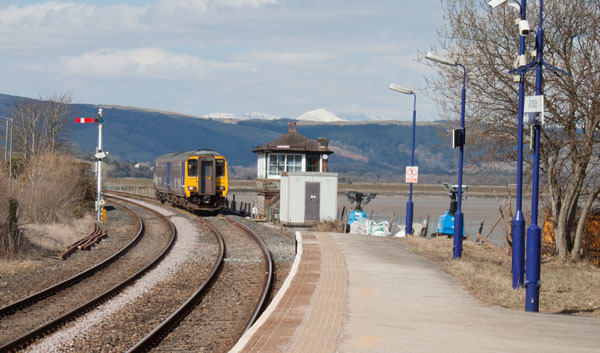 Cross the footbridge to wait on the platform for the train to Silverdale (not all the trains that call at Arnside stop at Silverdale). 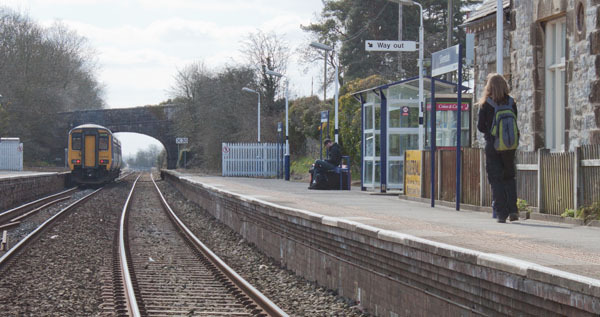 Alight at Silverdale and cross the track via the footway behind the train and leave the station following the Way out sign. Turn right to follow Red Bridge Lane for about 100 metres. 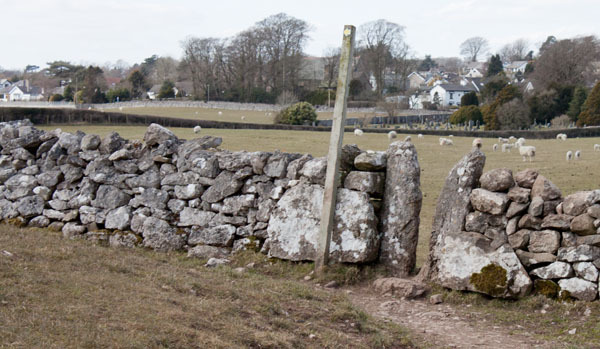 The white fingerpost points the way over a stone stile leading to the path across Silverdale Golf Course. 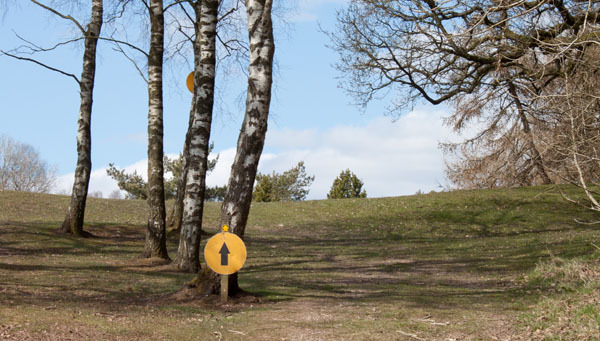 Once on the course, bright yellow circular signs point the way. 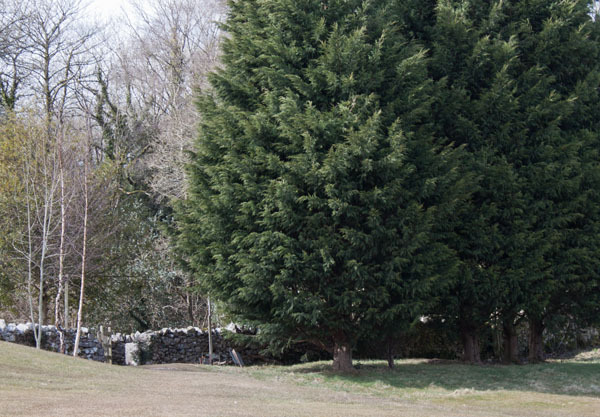 Leave the golf course by passing through a kissing gate set in the stone wall. Turn right along a narrow lane (The Row). 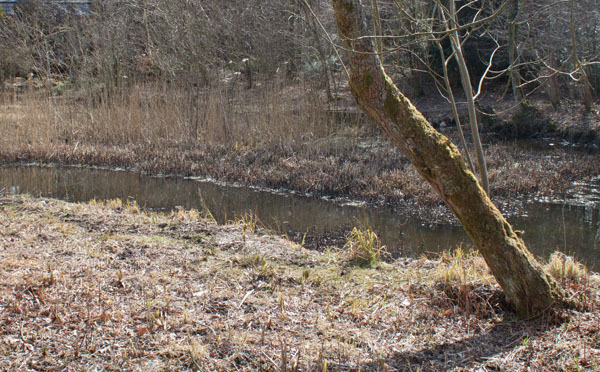 Follow the lane as it winds past Bank Well (pictured) - an ancient pond formed after the last ice age. 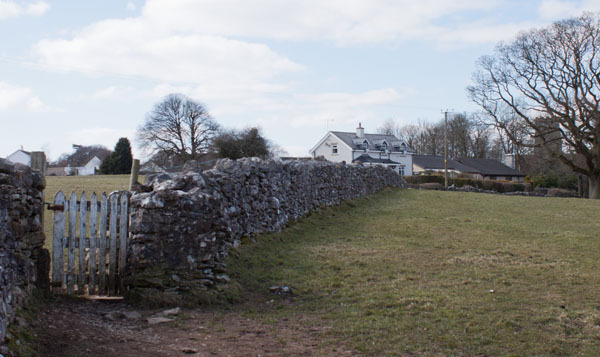 … pass through this narrow stile and turn left to walk alongside the wall. 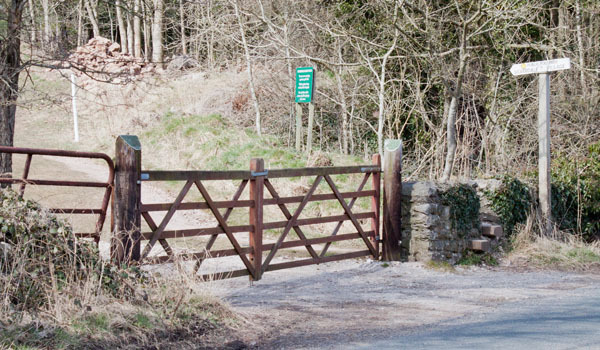 After less than 100 metres, a kissing gates leads on to a minor road. Turn right and then look out for another signpost to the church on the left. 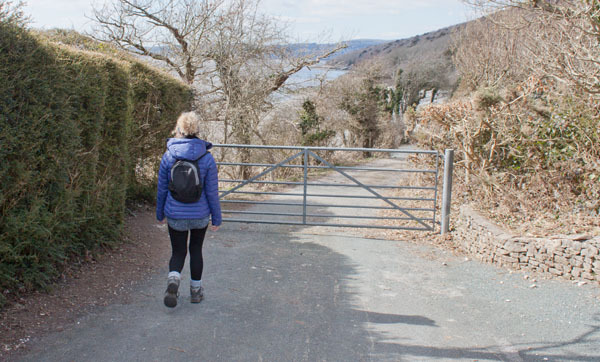 Pass through a kissing gate and walk alongside the wall on your left. Go through the gate in the wall (as pictured). Keep close to the wall on your right. 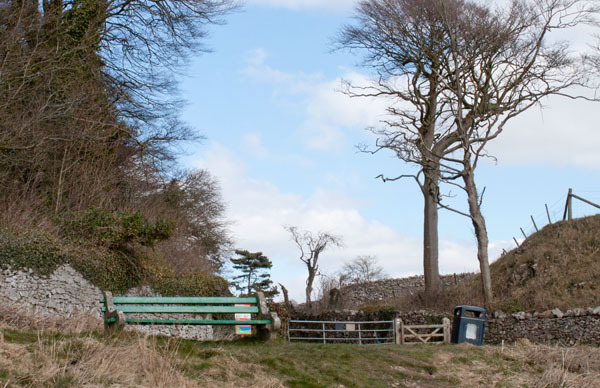 Squeeze through a stile to walk between a hedge on the left and a stone wall on the right. At a junction of tracks continue ahead (signed Emesgate Lane - care, so is the right hand turn). 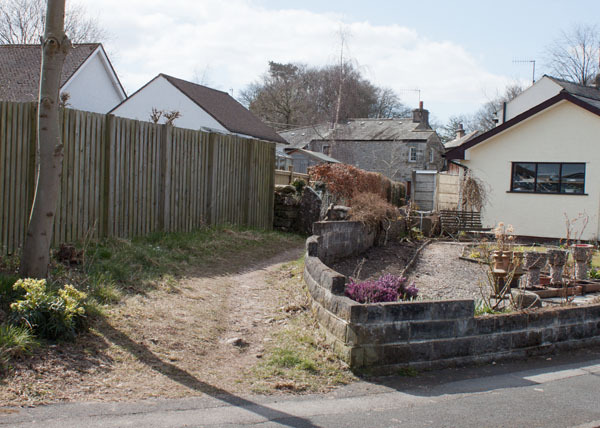 The path ahead leads into a cul-de-sac on a housing estate. At a T-junction walk straight ahead along the path pictured above. 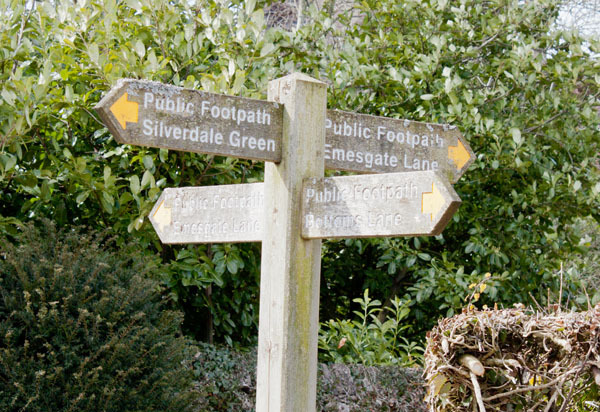 At the end of the path, turn left onto Emesgate Lane. 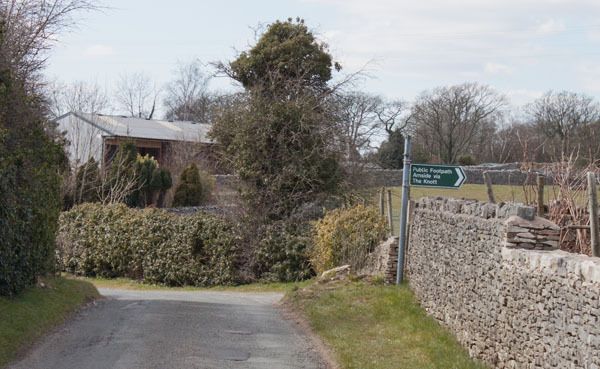 Follow the road down through Silverdale, passing a school, library and village store. Where the main road bears to the left, follow the road to the right, which leads to the shore. Walk through the gate onto the beach. Continue north along the beach for almost half a mile. 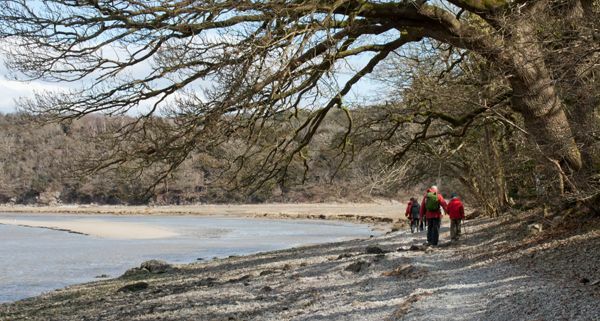 The route leaves the beach just before the cave in the picture (but we went to explore the shallow cave - the cover picture of the Kindle version of the walk was taken from inside it). Leave the beach via the wooden gate. Walk along the road and turn left at the first road junction. 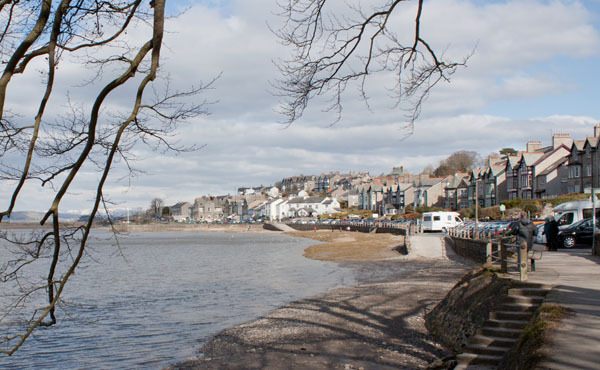 As you pass a sign announcing that you are in Cumbria, turn right, following sign for Silverdale Road and Far Arnside. Go through the green metal gate into a caravan site. Cross service road and continue ahead in same direction, heading towards a fingerpost. 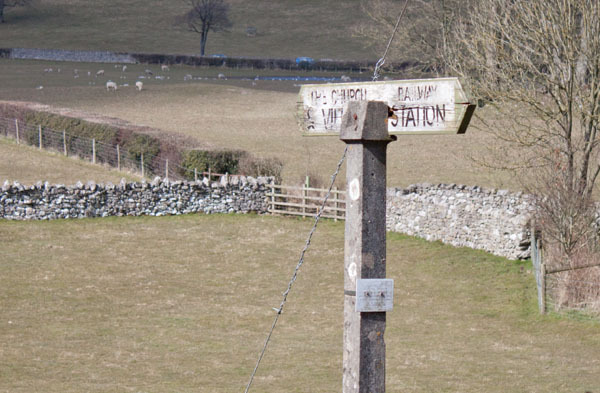 At the fingerpost, follow the direction for Far Arnside. This leads down the slope pictured above. 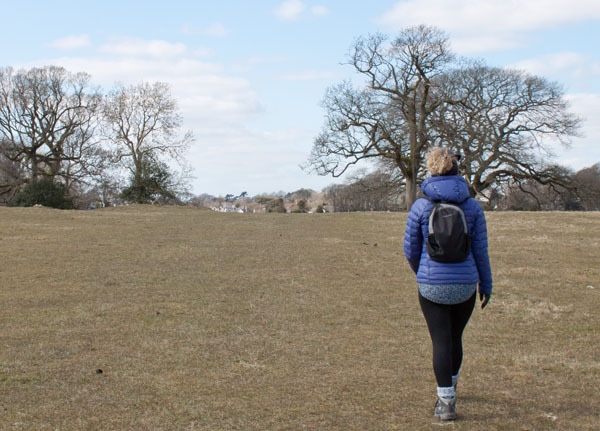 Pass through a metal gate and walk across the field ahead. 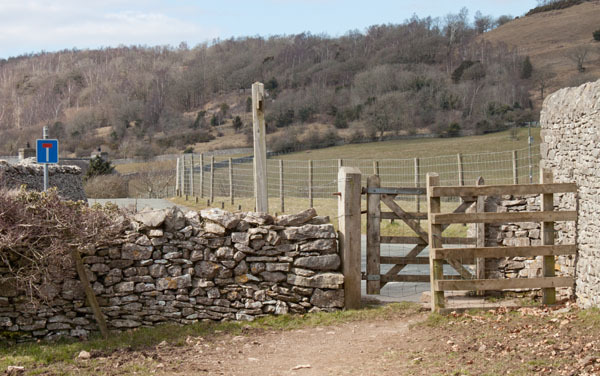 Leave the field through the wooden kissing gate, cross a minor road and continue along the road ahead (with the no through road sign). 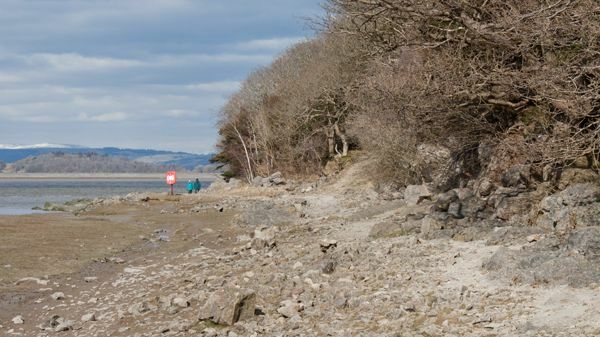 The sign on the right indicates an alternative route to Arnside, leading over Arnside Knott. 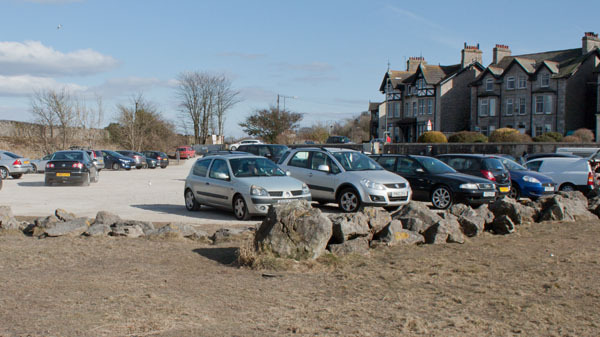 On this occasion we continued along the road into Holgates Holiday Park. 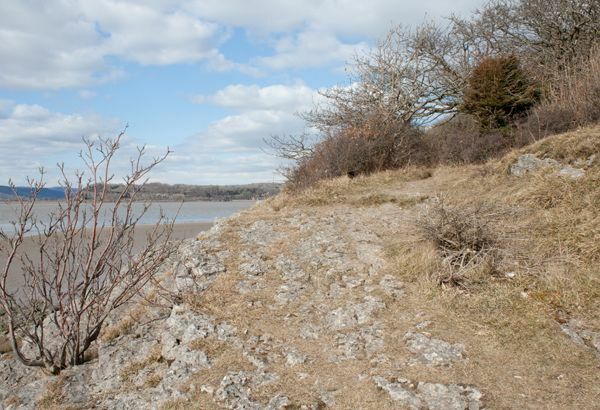 Continue ahead, following footpath sign (for Arnside Point) until the road forks. 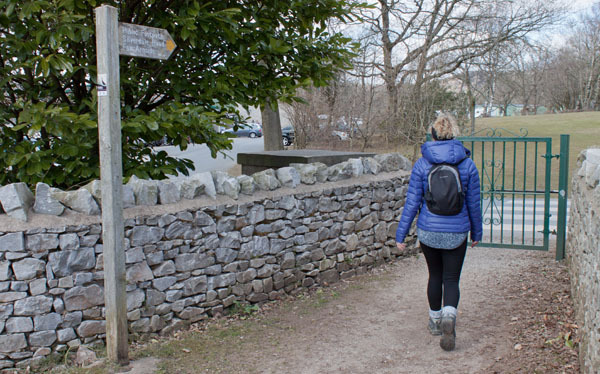 Take the left fork at the next footpath sign (Shore Close). … the beach. 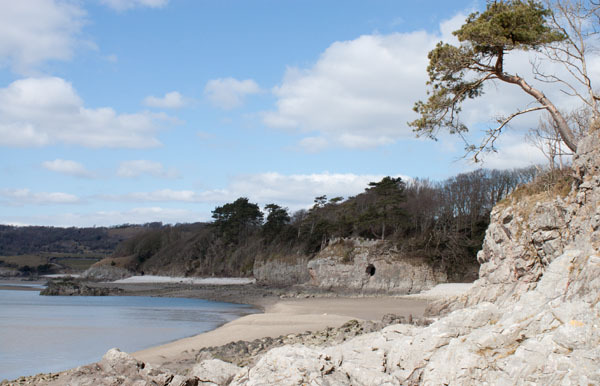 Walk along the beach towards rocks at the northern end. 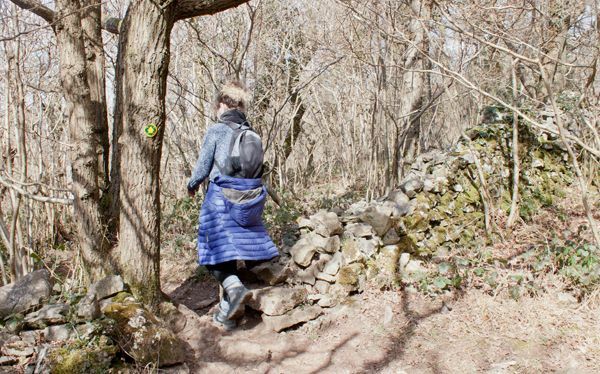 Climb over the rocks and walk through gap in stone wall to follow the path at the edge of woodland (there is a wooden bench by the path, just as you enter the wood). … and emerges from the wood. At this point there are steep drops down to the beach. … onto the beach again. 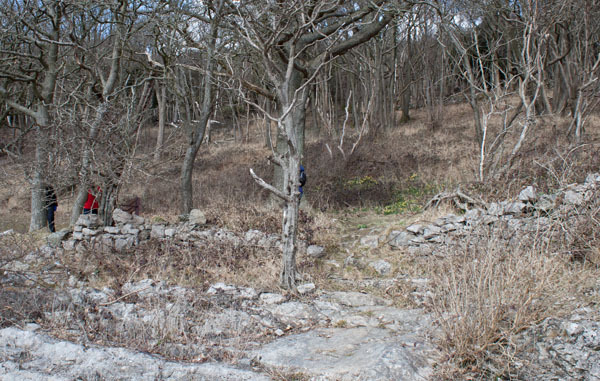 … and follow rocky slope up once more into woods at the edge of the cliff. The path leads once more down to the beach. Follow the beach round to join a concrete road. 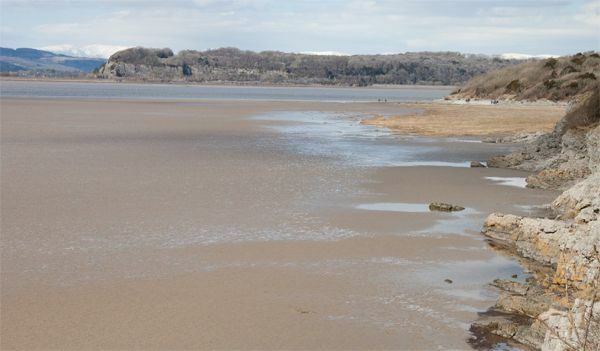 Turn left along the road, then leave the road by a sign saying Arnside via shore. 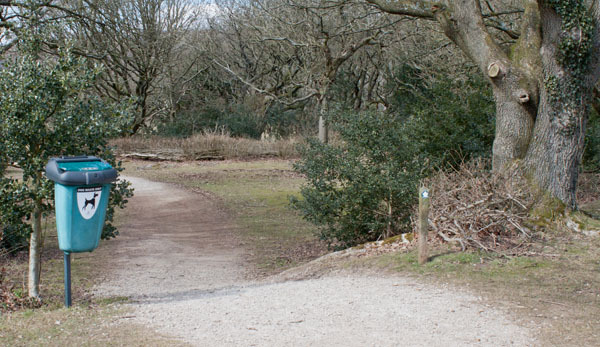 … this in turn leads to the southern end of the Promenade. Follow the road either back to the car park, or to the railway station.